iPad photo booth kiosks are here to stay so why not own the best one on the market! The gorgeous Mobibooth Aura™ features a smooth tilting head, easy access dimmer switch, interchangeable face plates (including mirrored) and accessible home button. Our precision fabrication is unmatched on the market (ask we’ll send close up shots, will our competitors?) and it is made right here in the U.S.A. Sleek lines, laser cut aluminum part (not fabric), miter perfect joints and flush mount hardware. This system will make you look like the ultimate professional to your clients. 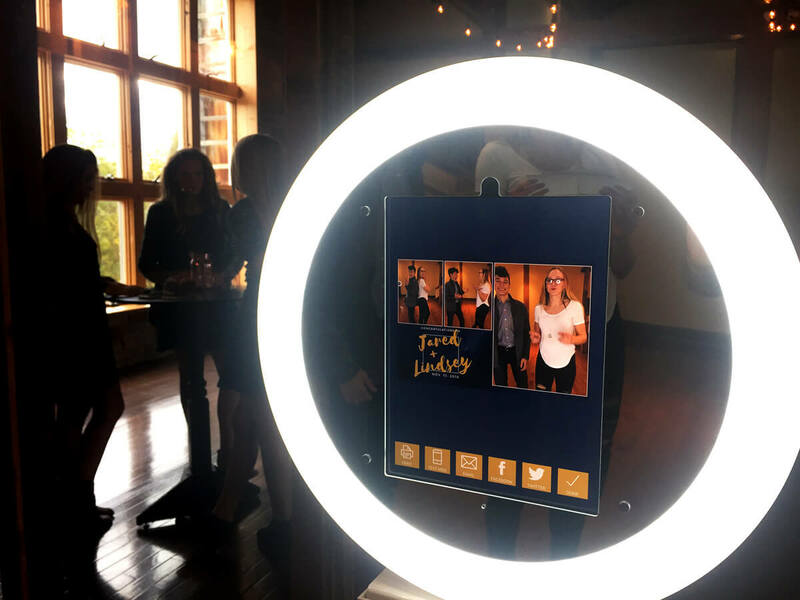 Paired with Mobibooth Cloud™ our easy to use yet powerful photo booth app with cloud based management and you have an affordable premium solution to stand out from the crowd. All new owners will receive 30 days free subscription to Mobibooth Cloud™. Interchangeable face plates available in mirror, black and white. Designed to set up or tear down in 3 minutes. Features interconnect wiring at each junction to provide the easy assembly and disassembly. Unit disassembles into 3 pieces plus a base plate. Total weight is 42 pounds and fits into a single TSA compliant rolling case. Optional TSA compliant rolling case provides protection during transportation from drops and water damage. Includes custom fitted foam. A unique constant friction smooth tilting head ensure that guests of all heights are framed perfectly in your photos. All aluminum parts are covered with a durable powder coat paint finish ensuring your kiosk looks great event after event. The fully assembled photo booth weighs only 42 pounds making it one of the most portable units on the market. Help spread the word of the photo booth's capabilities with option social media icon stickers. Ready to own the market's premier ring light photo booth? Configure the perfect booth for you business today. If you have any questions contact us at 800-731-6485 or info@mobibooth.co and a member of our team will be happy to assist. 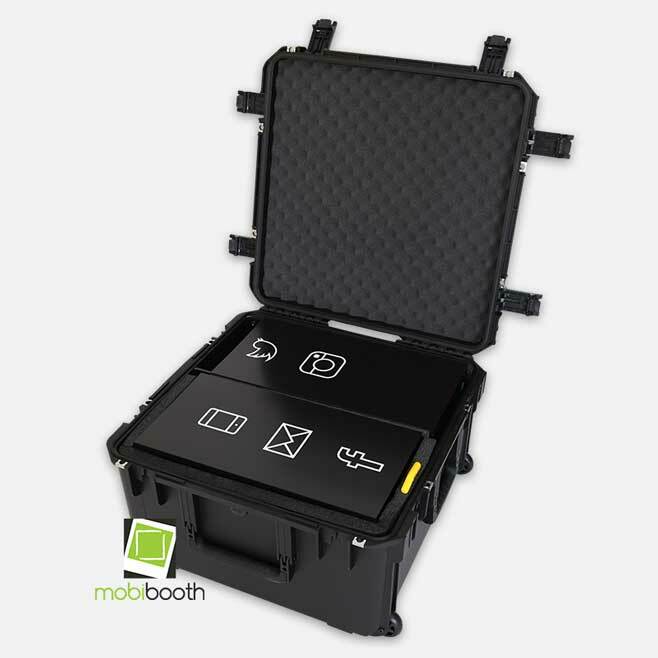 The Mobibooth Aura™ ships with an injection Molded Mil-Standard Waterproof Cases are molded of ultra high-strength polypropylene copolymer resin, featuring a gasket sealed, water and dust tight, submersible design (MIL-C-4150J) that is resistant to corrosion and impact damage. Features a molded-in hinge, patented trigger release latch system, comfortable, snap-down rubber over-molded cushion grip handle, automatic ambient pressure equalization valve (MIL-STD-648C), resistance to UV, solvents, corrosion, fungus and impact damage (MIL-STD-810F). The Mobibooth Aura™ provides easy access to the ring light dimmer switch allowing for adjustment as environmentally lighting changes. The Mobibooth Aura™ is available in gorgeous gloss white in addition to matte black. All hardware and exposed plastics are treated to be perfectly match the gloss white powder coat finish on the aluminum parts. Optional black social media stickers are available to help make your unit pop. Wrap It and Stand Out! 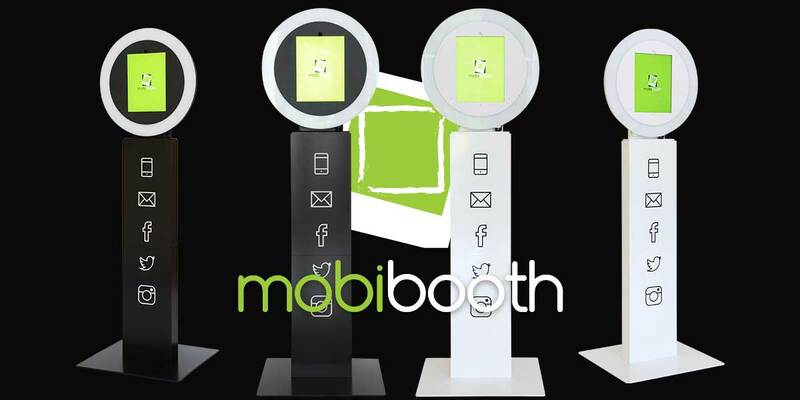 Mobibooth Cloud™ is a powerful photo booth platform that brings professional quality to our iPad photo booths. The platform consists of an easy to use iPad app and a powerful cloud based management system. The system has been built from the ground up with rapid deployment in mind. In app camera controls and the amazing 5MP front camera of the iPad Pro® 9.7" yield DSLR quality photos and video. Have the confidence to price your rentals the same as a DSLR based system. Software can do traditional prints from strips to postcards, GIF animations, boomerangs and video booths. Kick it up a notch with chroma key and take your guests anywhere in the world. More information available in our Mobibooth Cloud section. 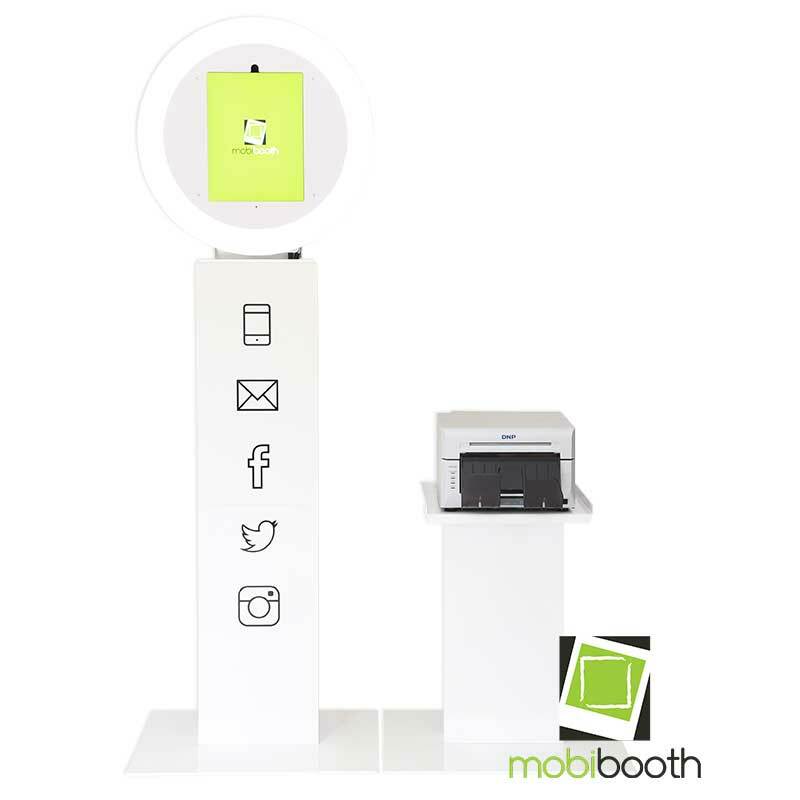 The professional look and feel of the Mobibooth Aura™ makes it the perfect photo booth for corporate events. Whether a hotel grand opening, storefront ribbon cutting or trade show you can rest assured that the Aura will shine. The gorgeous ring and inviting mirror draw guests right in ensuring that you deliver the throughput your corporate clients demand. 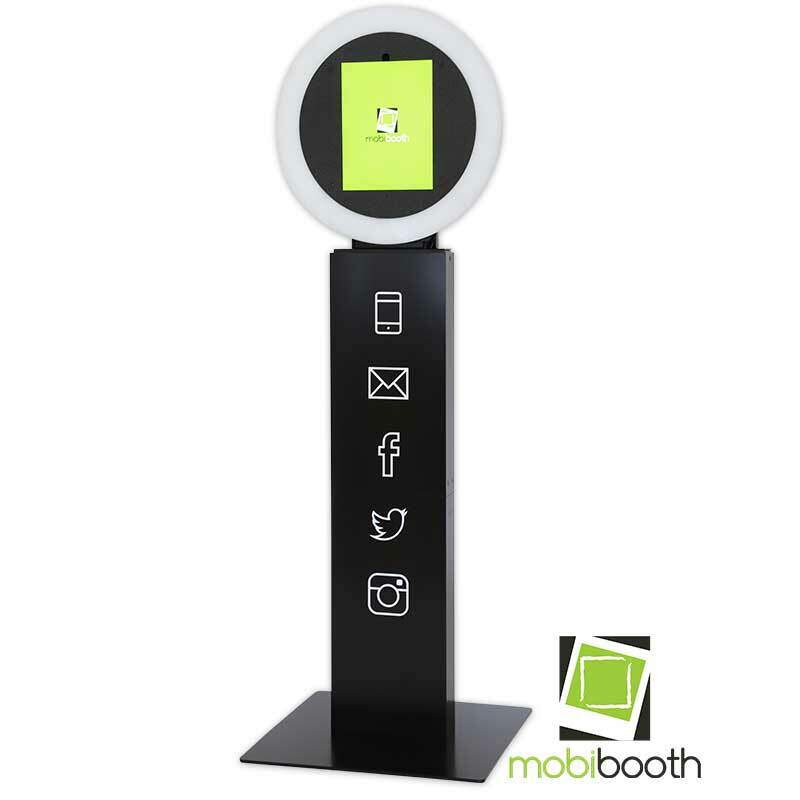 Coupled with the Mobibooth Cloud™ software your company will shine in the spotlight.